Commander Eric Tufnell RN (1888-1979). Original watercolour signed E Tufnell (LR) and annotated Falkland Is Action 8th Dec 1914 (LL). The story of The Battle of Coronel on 1st November 1914 off Chile is well known: Admiral Maximilian Graf Count von Spee's East Asia Squadron defeated Rear Admiral Sir Christopher Cradock's South Atlantic cruiser squadron in a resounding victory which saw the British squadron all but anihilated and Cradock, together with 1653 officers and men, killed. It was the Royal Navy's first defeat at sea for over a hundred years and coming so early in the Great War was a severe set back for the morale of the world's largest and most powerful navy. Nothing less than revenge - swift revenge - was required and the First Lord of the Admiralty, Mr Winston Churchill, and the First Sea Lord, Admiral Sir Jacky Fisher, were going to get it. Despite protestations from Admiral Sir John Jellicoe, C-in-C Grand Fleet who was concerned lest his number of capital ships in the North Sea drop below what he regarded as a safe level, the First Sea directed him to despatch with haste the battlecruisers HMS INVINCIBLE and HMS INFLEXIBLE to the South Atlantic, and HMS PRINCESS ROYAL to the Caribbean to cover the Panama Canal should von Spee's squadron emerge from there on its route back to Germany. It was at the Falkland Islands on 8th December that the two squadrons met and after a short chase Vice Admiral Sir Doveton Sturdee's ships overpowered and sank all but one of von Spee's ships, the DRESDEN escaping and evading detection and action for 12 weeks before she too was located and cornered by the Royal Navy. She scuttled herself. 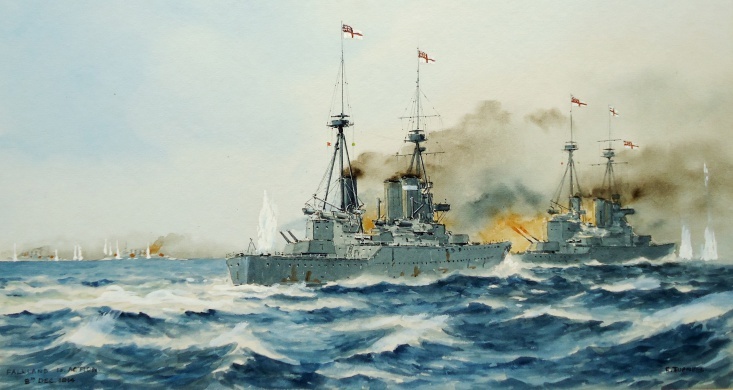 Tufnell's watercolour here shows Sturdee's the two battle cruisers, INVINCIBLE, wearing his flag, and INFLEXIBLE in line astern as they worked their way up to 25 knots and gave chase to the German ships. Smoke - both from the voluminous quantities the battle cruisers produced as their boiler room crews down below piled on the coal and from the guns of the ships as they went into action - caused fire control and spotting difficulties for the British at various stages of the fight but Tufnell appears to have captured the scene at an early stage when the battle cruisers were not engulfed in funnel and cordite smoke.